There’s a lot of uncertainty in the markets right now, which means it’s a perfect time to discuss one of the most powerful Total Wealth Tactics of all. Before I tell you what it is though, let me say that the tactic we’re going to discuss today can significantly boost your returns and reduce your losses – all while taking less than 90 seconds of your time. That’s about how long it will take you to “re-balance” your portfolio. Simply put, rebalancing is a strategy that ensures your money is working the way you want and, perhaps most importantly, is aligned with your individual risk tolerance, objectives, and financial aspirations. They don’t see a problem with letting their winners “ride.” That’s fine if you’re in a Las Vegas casino and want to leave your money on the table even as you continue to bet you won’t lose it, but that strategy is totally unsuited to today’s financial markets. 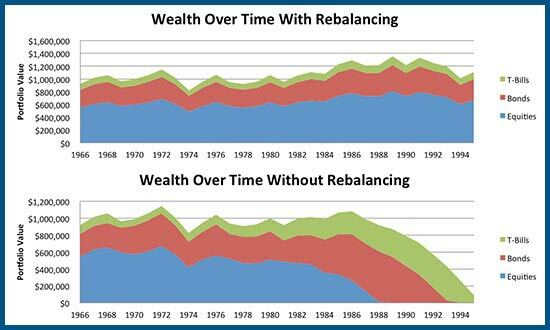 Every dollar you earn if they don’t rebalance means you’re taking on more risk. This is where many investors found themselves coming into the Dot.bomb crash of late 1999/2000 and the Financial Crisis of 2008. They thought they were doing great. What they didn’t realize was how concentrated their risk was becoming… in the very stocks that were making them gobs of money. Every day you’re not in the markets is a day of lost opportunity, which is why, in true Total Wealth style, we’ve talked about the importance of constantly investing in good times and in bad. Invest for one day and you’ve got approximately a 54% probability of making money in the stock markets. Invest for a year and that number jumps to around 68%. 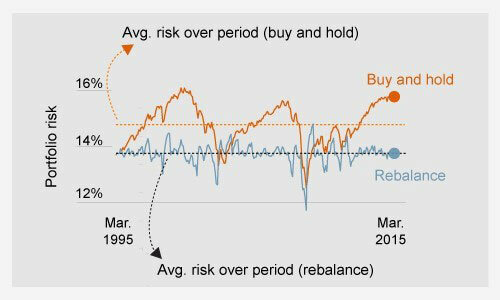 But leave your money alone for a full decade and the probabilities rise to a smile-inducing 87%, according to Dan Wiener and Jeff DeMaso of the Independent Advisor for Vanguard Investors, who based their analysis on returns from 1927 to 2014. The thinking here is pretty simple. Rebalancing ensures you are capturing profits and buying more of whatever’s on sale. Over time this can significantly reduce portfolio volatility AND boost your returns. This catches a lot of people by surprise. I’ve highlighted a simple percentage-based method today, but you could introduce variables related to trade risk, trading method, parity, or any number of other institutional grade concepts if you wanted. For all but the most sophisticated individuals, that’s overkill. The key to rebalancing successfully is to: 1) use predetermined thresholds like the 50-40-10 I advocate in the Money Map Report and 2) rebalance consistently when it gets out of line. That’s why, if possible, you want to rebalance within retirement accounts or using tax advantaged investments to avoid paying Uncle Sam any more than you legally have to. You can always work with a financial advisor or accountant to combine rebalancing with tax smart moves that pair gains with losses that are then applied against realized capital gains or ordinary income. There are a lot of people who believe that the markets are high and that, therefore, there’s nothing to buy. Don’t fall for it. 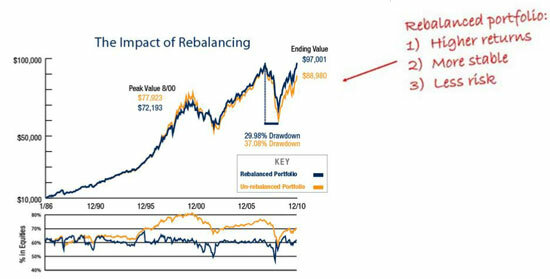 The risks of a correction may be mounting, but that’s why rebalancing is so very powerful. Because then you’ll know exactly what to buy no matter what happens next. You have mentioned this and told us to avoid emotion so many times. Keep reminding us, but believe me by now it’s embedded in the brain, still it must be practiced not just remembered. ++ BTW ++ Scenario # 1 was started today for ESKO today. Hi Barry, and thanks for reaching out! Keith’s definitely taken notice of recent developments with Ekso, and he plans to share his insights with the entire Total Wealth Family in an upcoming issue. Stay tuned for an update. As always, we greatly enjoy hearing from you, and thanks for being a member of the Total Wealth Family! If I want to invest for dividends, what would be best? Hi Hasan, and thanks for reaching out! If you’re interested in dividends, check out this Special Report Keith put together. It highlights an elite group of dividend payers with yields in the double-digits. There’s also a few articles in the Total Wealth archives that you might find interesting.